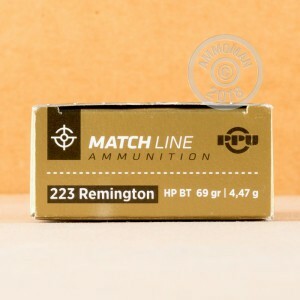 If you want match grade ammo without the match grade price, try this .223 Remington ammunition from Serbian manufacturer Prvi Partizan. These cartridges come in a 1,000 round case ideal for the serious precision shooter and fire a 69 grain boat tailed hollow point bullet ideal for accurate shots at extended ranges. Prvi Partizan of Uzice, Serbia is actually one of the older names in the ammo business, having been around since the 1920s. Their ammunition has been used by hunters, target shooters, and military forces for decades and enjoys a good reputation for cost-efficiency and quality. 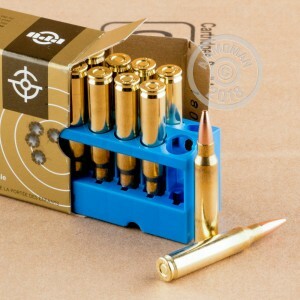 All PPU ammo uses non-corrosive Boxer primers and brass cases. 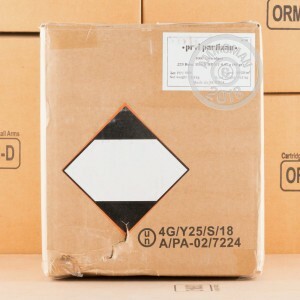 Buy this 1,000 round case at AmmoMan.com and instantly qualify for free shipping! Went to a long range shooting course and this stuff shot .80 inches out of a precision rifle. I shot black hills 75 gr out of the same rifle and it shot .60. So you decide the black hills ammo is about $1 each. I can almost shoot two of these for one black hills.